Is your tri routine a little tired? You're not alone. Work these six new moves into the mix, and bring back that burning feeling! No matter what type of lifter you are, a set of strong, developed triceps should be on your wish-list. Unfortunately, the tools and techniques that dominate many people's triceps training are less than optimal. In some cases, we stick with implements that we see other people using, even if we end up with sore elbows and shoulders. In other cases, we go heavy when we should go light, cheat when there's nothing to be gained from it, or ignore great tools that are hiding in plain sight. Luckily, your triceps training doesn't have to be complicated to be effective. Try these six moves and be prepared to be surprised at how simple changes can make a big difference! Research has found that doing push-ups with your hands on a stability ball increased both triceps and pec-major activity compared to normal push-ups. If you're looking for a way to burn out both your chest and tris, you couldn't do much better than this! How you set up is important, though. For one, make sure the stability ball you use is well-inflated. Then, turn your hands outward so they're closer to palms facing than palms down. Yes, this will feel weird at first, but it's far more wrist-friendly and comfortable once you get the hang of it. Instead of performing dumbbell skullcrushers in the conventional manner, use two dumbbells. Holding a dumbbell in each hand allows you to keep your elbows from flaring out to the sides, while being more comfortable and less awkward on your shoulders. If your elbows and shoulders haven't liked skullcrushers in the past, this is definitely worth a try. To make it even better, grab the dumbbells so that your pinky fingers are against the inner edge. It may only be a difference of an inch or two from where you normally hold them, but this grip makes you work a bit harder at the top of the range of motion. 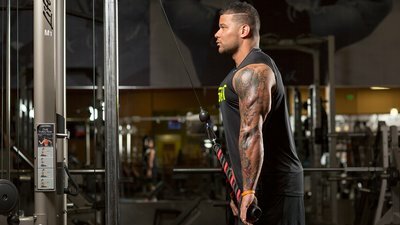 To further boost time under tension, avoid total lockout at the top of each rep.
As I explain in my article "The 6 Grittiest Biceps Exercises You're Not Doing," all exercises that involve free weights or cables have a point within the range of motion where the exercise is hardest on the muscles involved, and a point where the exercise is easiest. You can manipulate this to hit your muscles differently within the same exercise. With that in mind, you can change the point of maximal loading by alternating between three elbow positions: low (close to your head), perpendicular to the floor, and higher above you. Each one will create a different stimulus and hit your triceps from a slightly different angle. To integrate these angles into your training, you could alternate them in training sessions or perform several of them in straight sets. Alternately, you could super-set two of these elbow positions or perform all three as a triset. Just be warned that you'll probably have to switch the loads between angles if you perform them as supersets or trisets, especially once you start to get fatigued. 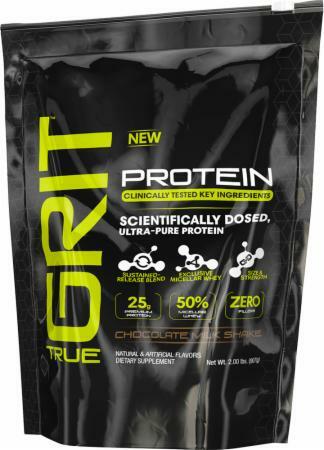 25g Of Scientifically Dosed Protein To Support Building Muscle! This is a compliment to the cable-curl mechanical dropset from the "6 Grittiest Biceps Exercises" article. If you're already working your arms, work these in as supersets, or as part of a total upper-body assault like my video "The Gritty Workout Your Upper Body Needs". Using a triceps rope or straight bar attached high on the cable column, walk away from the cable until its angle is roughly 45 degrees. Keeping your elbows at your sides, perform triceps press-downs. At this angle, the point of maximal muscle tension is where your elbows are extended, close to the bottom of the range of motion. Once you can't maintain good technique, walk forward so you're standing directly in front of the cable. Now perform more triceps press-downs while keeping your elbows by your sides. Since the cable is more vertical than before, it's creating a point of maximum mechanical tension when your elbows are bent closer to 90-degrees, close to the mid-range of the motion. Both of these cable triceps press-down variations work well as stand-alone exercises. That said, if you're doing these moves as a superset, try to find a weight load that allows you to perform around 8-10 reps of each version. You may have to adjust the weight load between each variation in order to accomplish that rep range as you get tired. Thinking of doing some dumbbell kick-backs? I'd recommend walking over to the cable stack instead to perform the same movement, only using a low pulley. The reason is that the dumbbell gives you no loading demand on the triceps at the bottom of the exercise, which is where you're strongest. And, at the top of the range of motion, where you're weakest, the weight is at its most challenging. This is why so many people are forced to cheat (by using momentum or dipping their arm or torso farther forward) at the top of the range of motion when doing dumbbell kick-backs. Sure, you could just go lighter. However, I would recommend simply using a low cable instead, and setting it up at roughly a 45-degree angle to the floor. This not only loads the bottom position of the exercise, it also creates the longest lever arm in the mid-range aspect of the motion, and creates a short lever arm at the top of the action. In other words, you get more resistance where you're stronger, and less where you're weaker. But at no point in the movement will there be no resistance, since a cable provides some degree of constant tension. If you've got a cable machine at your disposal, you owe it to yourself to try this. Wait, didn't I just say that the cable kickback is a better choice than dumbbells? Sure, but the resistance curve involved in dumbbell kickbacks doesn't make this exercise bad, dangerous, or ineffective. It simply means that we have to be aware of these factors and do what we can to overcome them. First of all: Go lighter on kick-backs, since there's nothing to be gained by going heavy. This movement is best for loading the top of the range of motion when your elbows are extended and your triceps are contracted. I recommend selecting a weight no heavier than what you can hold for about 4-5 seconds at end of the concentric portion of the range of motion. If you can't hold it with your elbow fully extended and arm parallel to the floor for a few seconds, then the weight is too heavy to maintain control on each rep.
Then, rather than simply repping out, perform iso-dynamic kick-backs. These are a great way to ensure that you perform this exercise properly, while also giving you one heck of a muscle pump! Here's how it's done: Grab a dumbbell in each hand and assume a bent-over rowing position with your torso parallel to the ground. Then, perform a bent-over row with both arms. From this position, extend both of your elbows so that your arms are straight and parallel to the floor. Hold your left arm at the top of the kick-back while you perform normal kick-backs with your right arm. Perform five reps on your right side while your left side does the isometric hold. Then, switch and perform five dynamic reps on your left side while your right side performs a hold. Repeat the process doing four dynamic reps on each side, and then three reps.
To finish, perform two reps using both arms simultaneously. If you're struggling for mental clarity at the end of the ladder, remember it this way: two arms for two reps. Even with a tiny weight, your tris will be smoked! Contreras, B., Schoenfeld, B., Mike, J., Tiryaki-Sonmez, G., Cronin, J., & Vaino, E. (2012). The Biomechanics of the Push-up: Implications for resistance training programs. Strength & Conditioning Journal, 34(5), 41-46.